Although not registered, the great Bold Minstrel possessed the best traits of his Thoroughbred ancestors. He was big (16.3), beautiful, brave, talented, and had the heart of a lion. No matter the discipline, he excelled. Foaled in Ohio in 1951, Bold Minstrel was by the Thoroughbred stallion Bold And Bad (by Blue Larkspur), out of Wallis Simpson (a hunter mare who was the result of test-breeding a mare of unknown breeding to the young Thoroughbred stallion Royal Minstrel). His breeder, Oliver DeGray Vanderbilt, was Master Of Foxhounds of the Camargo Hunt and also the grandfather of Lafreda Schneider (now Williams), a young eventing enthusiast. Mr. Vanderbilt gave the grey colt to his granddaughter, who broke him as a 2-year-old and started showing him at small shows. After a day of showing at some hunter trials on the outskirts of Cincinnati in 1956 with his experienced horse Trecla, Bill Haggard, a 29-year-old horseman from Nashville, escorted Ms. Schneider to the Camargo Hunt Ball. By the end of the weekend, Mr. Haggard and his date had swapped horses. Mr. Haggard was now the owner of the 5-year-old Bold Minstrel, while the less experienced Ms. Schneider owned the more experienced Trecla. 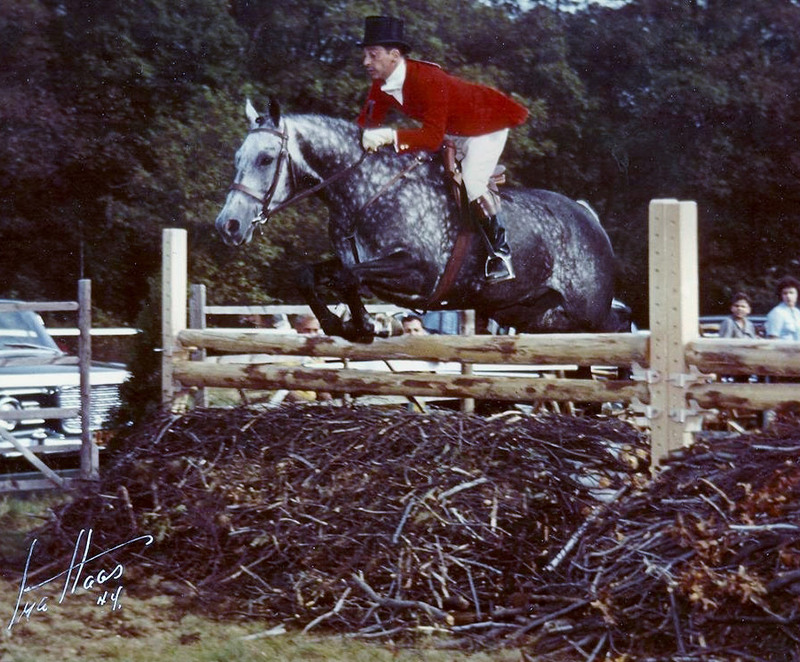 Back in those days, it was not uncommon for horses to compete in multiple disciplines as well as foxhunt, so Mr. Haggard and “Fatty” (as he was called because of his ability to live on very little and still remain fat) started foxhunting, showing, and eventing. 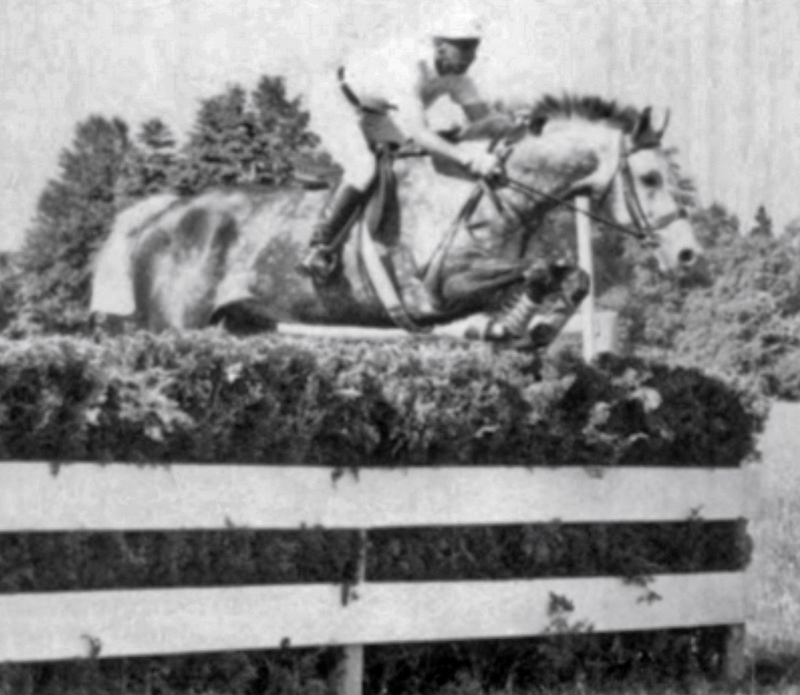 Bill Haggard during the Steeplechase phase of eventing at the 1959 Pan Am Games. 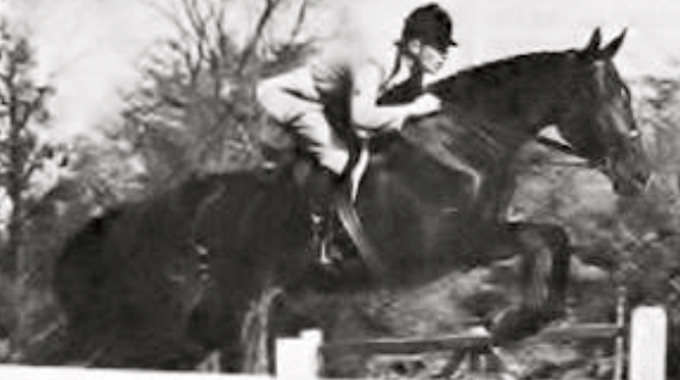 As members of the US Eventing Team for the 1959 Pan American Games in Chicago, Bold Minstrel and Bill Haggard finished 9th individually and helped the USET win the Team Silver Medal. 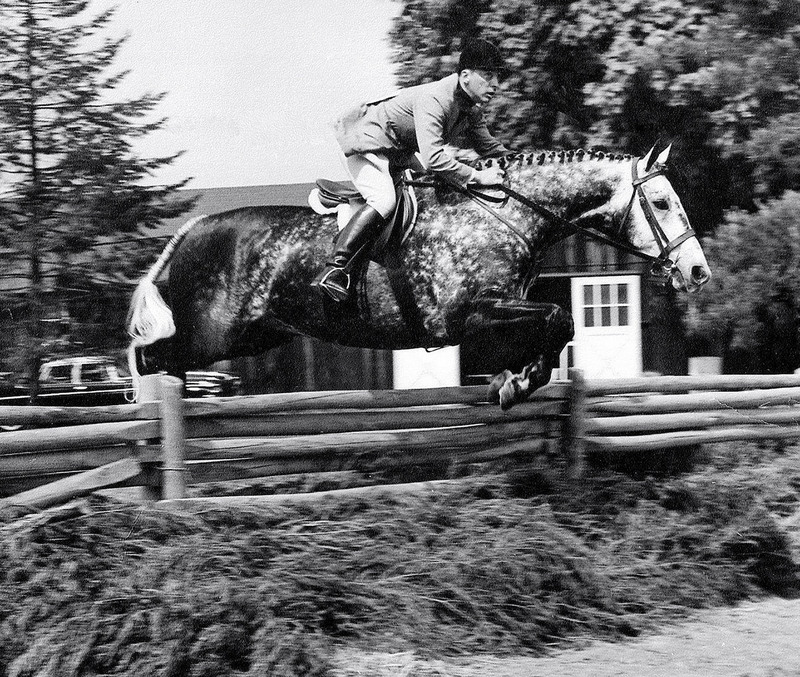 After the Pan Am Games in 1959, the pair headed to the A shows to show in the Conformation Hunter division. Some of their highlights were being Conformation Champion at The Royal Winter Fair (Toronto) in 1960, Reserve at Pennsylvania National (Harrisburg) in 1960, Champion at Milwaukee Hunt Club in both 1960 and 1961, Champion at Fairfield Hunt Club in 1961, Reserve Champion at the National Horse Show (New York) in 1961, and Ladies Hunter Reserve Champion at Devon in 1961 (ridden by Eve Fout), where Bold Minstrel also won the Newbold Ely class for horses that hunted regularly with a recognized hunt – the first Conformation Hunter to win the prestigious class. The Summer of 1963, Mr. Haggard and his big grey represented the USET once again at the Pan Am Games. This time, their results were even better than in 1959. The pair finished 4th individually and they were part of the Gold Medal winning team. Bold Minstrel and Mr. Haggard were selected as alternates for the 1964 Olympics in Tokyo. When Mike Plumb’s horse, Markham, had to be destroyed on the flight to Japan and left the top rider without a mount for the Olympics, a phone call was placed to Mr. Haggard asking for the use of Bold Minstrel. 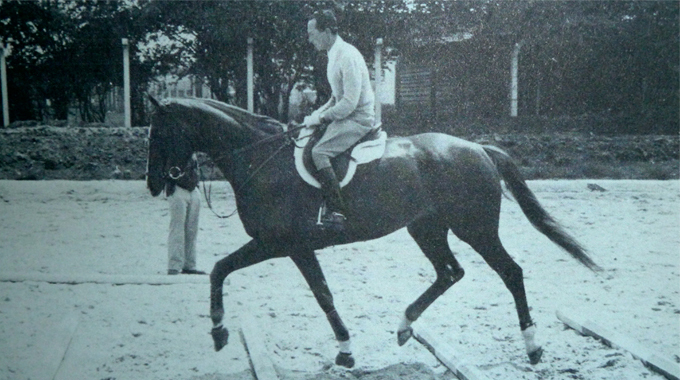 Although Mr. Haggard had hoped that the team wanted him in addition to his great horse, he generously loaned the team “Fatty” and flew on the plane with him to Tokyo. Mike Plumb only got to ride Bold Minstrel for two weeks before competing in the Olympics, but their excellent dressage ride, clear round in jumping, and good round on cross-country combined for a 15th place finish individually and a team silver medal. 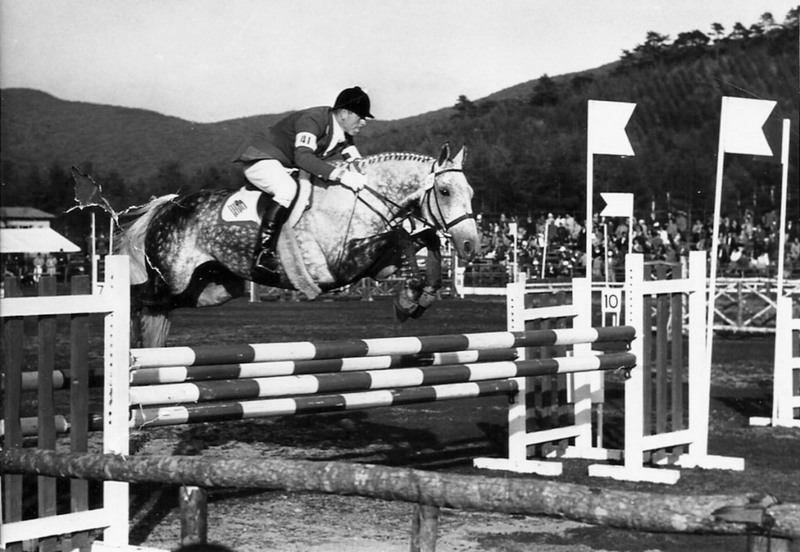 Bill Steinkraus, the USET Show Jumping Team Captain, had first seen Bold Minstrel as a 5-year-old before Bill Haggard owned him. He “thought he was a knockout and advised Billy not to hesitate” to make the trade. After the ’64 Olympics, Mr. Steinkraus continued to plead with Mr. Haggard to let him turn “Fatty” into a Nation’s Cup horse. After three years, Mr. Haggard gave in and Mr. Steinkraus picked up the ride on Bold Minstrel. Starting in 1967 and continuing until 1970, Bill Steinkraus and Bold Minstrel had much success as members of the USET. They won International classes at Pennsylvania National (in 1967 and 1969), the National Horse Show (1967, 1969, 1970), Cologne (1970), and won three classes at Lucerne in 1970 when Fatty was 18-years-old. At the 1967 Pan Am Games, the pair finished 9th individually and were part of the Silver Medal US team. They were 9th individually at the World Championships in LaBaule in 1970. 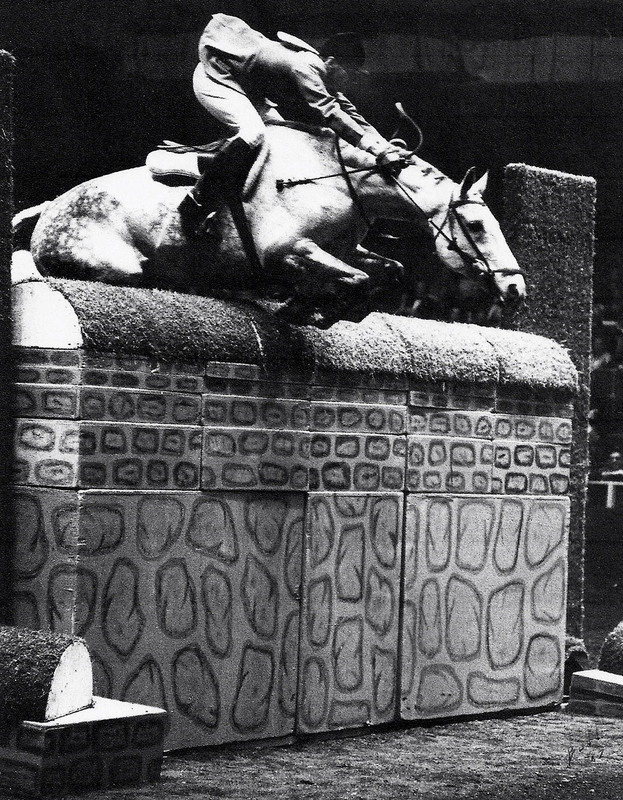 Bill Steinkraus riding Bold Minstrel in the International Puissance at the National Horse Show in 1967. By all accounts, Bold Minstrel’s most thrilling victory, with Mr. Steinkraus riding, was the International Puissance at the National Horse Show in 1967. The night before the International class, Russell Stewart on Dear Brutus had set a new Indoor Puissance record by jumping 7’3”. Arthur McCashin, the course designer and former USET Captain, raised the big wall for the International class from 5’8” to 6’8” to 7’3” instead of the normal three inches at a time. Bold Minstrel was the only horse to clear the wall so he tied Dear Brutus’s record from the night before. Mr. Haggard had a bookshelf built in his home to the exact dimensions of the 7’3” wall and placed the trophy on top of it. Bold Minstrel had everything I look for in a jumper – courage, intelligence, a phenomenal jumping mechanism, and scope to spare. However, the ‘bold’ part of his name was no misnomer, and at first he was pretty stubborn about insisting on doing everything his own way. 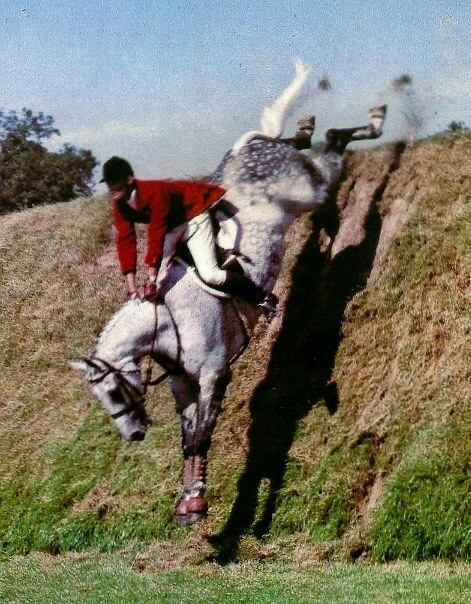 In my last book on riding, I included a picture of him jumping into space from the very top of Hickstead’s big bank, poking fun at my fallibility in thinking he’d just automatically hesitate, and then pick his way down. Eventually he learned to listen at least a little bit to me – after all, I got to walk the courses and knew what was coming – but he still had to teach me how he preferred to jump very big walls. 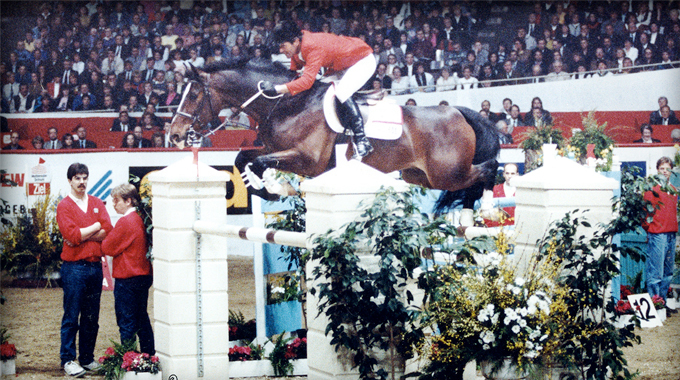 When the final puissance fence exceeds two-meters – six feet, seven inches – most horses don’t like to stand off too far, and would rather slightly crowd the fence than reach for it. I knocked down a couple of big walls doing this with Bold Minstrel, until one day I missed my distance and got a bit long to the wall. He simply stood off at it and jumped it like a stag. From then on, I always looked for a slightly longer spot and don’t remember him having another wall come down, including the 7’3” wall in the ‘old’ Madison Square Garden. Bold Minstrel has been inducted into the National Show Hunter Hall Of Fame. 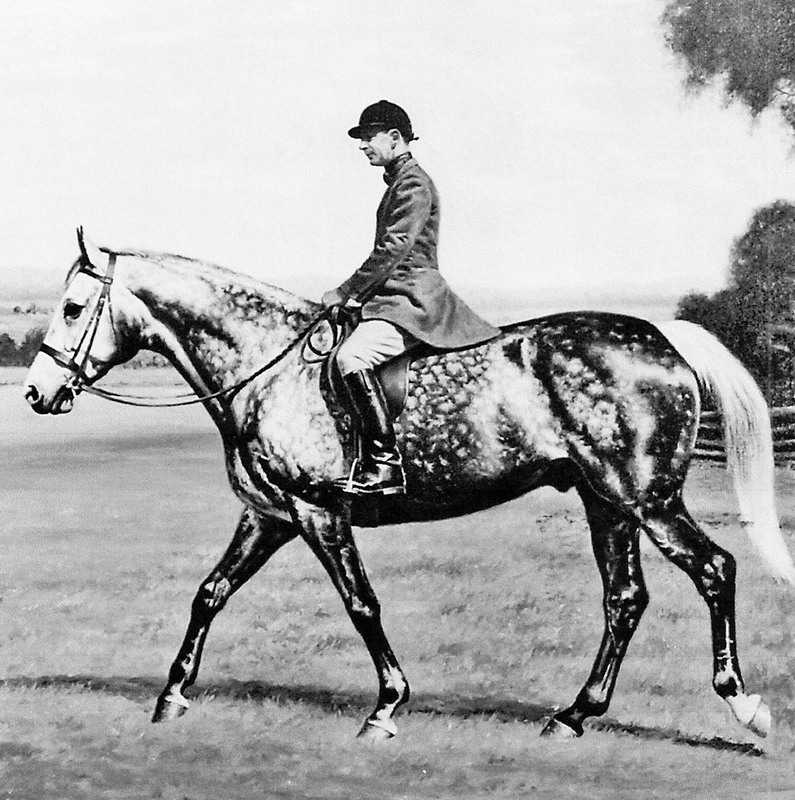 He excelled as a show hunter, foxhunter, eventer, and show jumper. “Fatty” earned medals in three Pan Am Games and one Olympic Games in two disciplines. A feat never equaled. The USET trained for the 1960 Olympics at Rancho San Fernando Rey in the Santa Ynez Valley near where I grew up in Santa Barbara. Billy Haggard was a friend of my mother’s and we went to visit with him. As a 12 year old it was a huge thrill to sit on Bold Minstrel. He was just the loveliest horse. Wow! That would have been such an amazing experience! Thanks for sharing. Growing up in Gladstone NJ I worked at a boarding barn where the Haggards had their horses. I very well remember exercising “Fatty” out of that stable.Pretty special for a 13-14 year old gill!! Billy and Holly were extremely gracious and fun people. They talked of trying to breed another Bold Minstral. As I recall they were starting with a Percheron/Tb mare. I think they felt it would take 2 generations..Since there hasn’t been another like him, I guess the breeding program didn’t work. We’d call him an American Warmblood today. So special. That would have been awesome to have another Bold Minstral he was one in a million. Thanks for sharing.